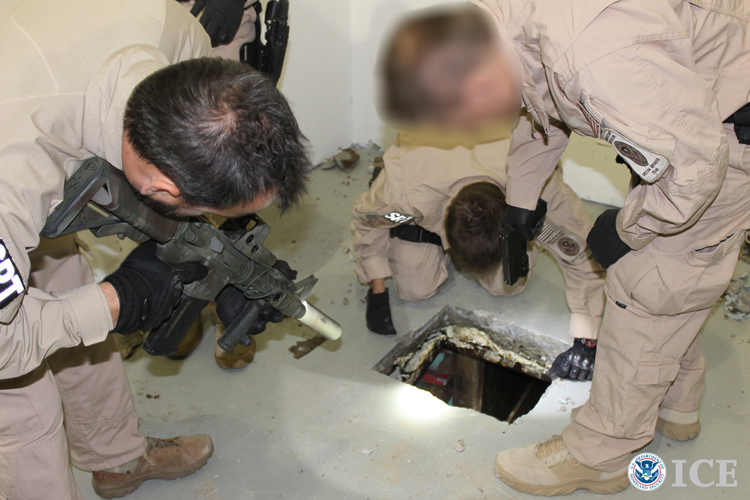 SAN DIEGO - U.S. authorities say a task force working with Mexican counterparts discovered two cross-border smuggling tunnels stretching hundreds of yard between Tijuana and an industrial park in San Diego. A U.S. Immigration and Customs Enforcement statement Friday says a woman from Chula Vista, California, was arrested for allegedly overseeing logistics at a warehouse where one of the tunnels surfaced in San Diego. The first tunnel, stretching about 600 yards, was discovered on Tuesday. Authorities say it was equipped with lighting, a crude rail system and wooden trusses. The other tunnel was discovered Thursday. It's described as stretching more than 700 yards and more sophisticated, with an electric rail system and ventilation equipment. The tunnels are the sixth and seventh found in the area in less than four years. The ongoing investigations into the two tunnels are being conducted by the agencies that make up the San Diego Tunnel Task Force, including HSI; U.S. Customs and Border Protection (CBP) - Border Patrol; the DEA; and the U.S. Attorney's Office. Additional support for this investigation has been provided by CBP's Office of Field Operations. "These discoveries are a clear example of what solid police work and collaboration can do to disrupt the efforts of criminal organizations," said San Diego Sector Border Patrol Chief Patrol Agent Paul Beeson. "We are not going away and will continue our efforts to investigate, interdict and arrest those who try and circumvent the border in this manner."